Author Stacey Alfonso-Mills has written and self-published two children’s illustrated storybooks under the series ‘The Boys of Sinclair Hill’. The series feature the fun times and experiences of 3 brothers – Matt, Addie and Alex. Their stories are designed for girls and boys in the beginning/early reader age group and from any part of the world. Stacey’s books are imaginative and feature Caribbean elements, which also make them creative and unique. 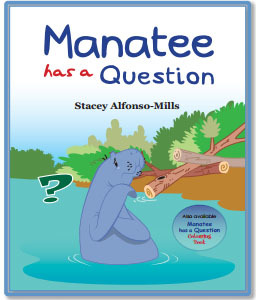 Stacey Alfonso-Mills, local children’s author, officially launched her third children’s illustrated storybook MANATEE HAS A QUESTION at the children’s section of NALIS Port of Spain on April 16, 2014. She also visited Trimont College in Glencoe,to present a complimentary copy of Manatee has a Question to the school’s growing library. Author presenting copy of Manatee has a Question to school Principal Mr. Herman Rodriguez and school Librarian Mrs. Diasie Sammy-Christopher.